A couple of weeks ago Nikki mentioned a product that she likes called Coffee Break by Medicinal Foods. 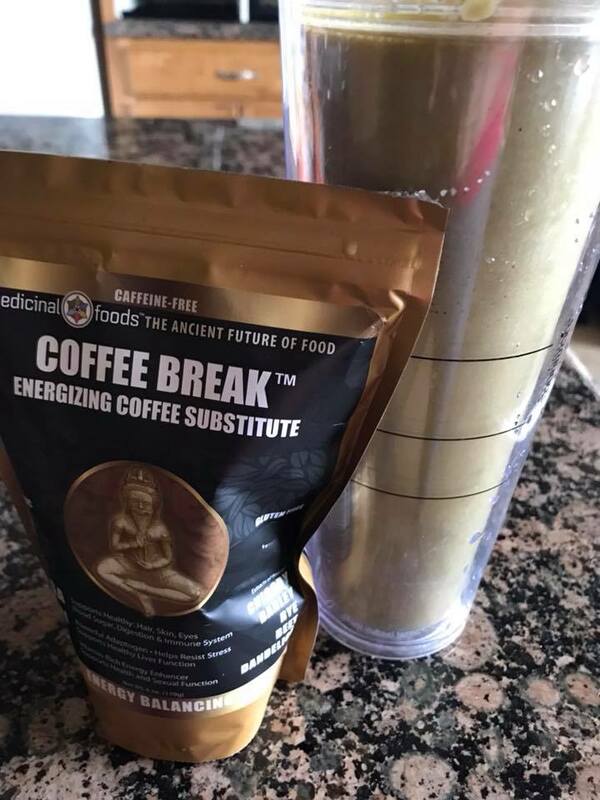 This product contains Chaga and Reishi mushrooms which I have been wanting to incorporate into my diet, so I ordered it. This product is a caffeine-free natural energy drink that tastes great! It contains roasted Chicory, Barley and Dandelion boosted with superfoods: Chaga mushroom, Reishi mushroom and Maca Root. Reishi: Is a powerful adaptogen that helps resist stress and supports healthy liver funtion. Maca Root: Vitamin rich, amino rich energy enhancer, supports health and sexual function. From the get-go this product contains a nutritious power punch! I decided to add it to a green smoothie to make it even more nutritious. In one drink you get your breakfast smoothie and energy boost- after that who needs coffee? I have now been coffee free for 1 week! With no withdrawal headaches. Order Coffee Break so that you can make this too! Put all the ingredients in the blender except the bananas. Blend down the romaine lettuce. Add the bananas and blend until smooth. Previous Article Group Training v. Personal Training: Which is Right for You?